Think twice about the Optima LX 1.6T; it's more fuel efficient on paper, but we like the drivability of the non-turbo 2.4-liter engine the most. The Kia Optima is a distinctively stylish and capable mid-size sedan worth serious consideration. The 2017 Kia Optima offers its own take on the right recipe for a mid-size sedan with its European styling, coupe-like roofline, and wide range of engine choices. 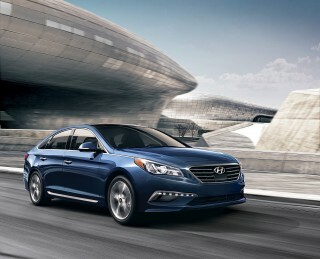 Underneath its taut lines and coupe-esque silhouette sits a vehicle that's very similar to the Hyundai Sonata. Like the Sonata, the Optima squares off against the Toyota Camry, Honda Accord, Mazda 6, the Ford Fusion, and the Subaru Legacy. The Optima was redesigned last year, a follow-up to the model that essentially rebooted Kia in the hotly contested mid-size sedan segment. After spending some time with the latest Optima, we can say that it doesn’t mess too much with the good things its predecessor brought to the table. Instead, it fine-tunes, finesses, and fetters every detail in between—to create an Optima that was all-new but keeps close to the form of the much-loved outgoing model. For 2017, the Optima carries over basically unchanged aside from 18-inch wheels now standard on SX and SXLs and some minor option package shuffling on other trim levels. In design and styling, the last Optima was a resounding success, as it pushed the brand’s mid-size sedan entry from faceless to fashionable. As the saying goes: "If you liked the old one..."
The 2017 carries over last year's new look—but if you weren't paying attention, you may not have noticed a full redesign for 2016. From the outside, the Optima continues to embrace many of the design traits that used to be verboten in a sedan—like the swoopier, coupe-like roofline (elongated just enough to assure some back-seat head room), a greenhouse that tapers at the rear, and proportions that are almost like those of a rear-wheel-drive sport sedan. It's a theme started several years ago, but the latest model sharpens the focus with cleaner detailing and a more cohesive look. It's a style that has matured into a more nuanced, grown up look. Inside the change is much easier to see thanks to better utilization of the space allotted for passengers and their gear. The dash is no longer as segmented and visually canted toward the driver’s seat. Trims, buttons, and switchgear inside improve by leaps and bounds, and you won’t have to look far to see the level of improvement here in the details. The latest Optima is marginally longer, taller and wider than before, and these changes add up to a slightly roomier and more comfortable cabin, along with more trunk space. All models boast a height-adjustable passenger seat, a rarity in this segment and one that doesn't make the shotgun seat feel like second class. Trunk space stands at 15.9 cubic feet, which is a little on the tight side for the segment, but there's a wide opening into the cabin and standard split-folding rear seat backs. Kia offers a trio of 4-cylinder engine choices: a 1.6-liter turbocharged 4-cylinder engine that was new last year and two engines that carry over from the previous generation, a 2.4-liter naturally aspirated unit and a 2.0-liter turbo. The 2.4-liter GDI engine available on LX and EX models produces 185 horsepower at 6,000 rpm and 178 pound-feet of torque, while the 2.0-liter turbo generates 245 hp at 6,000 rpm and 260 lb-ft of torque at 1,350 rpm. Both engines are slightly down in power over the previous versions, but they’ve been retuned for better drivability and fuel economy. All models get a multi-mode switch for Eco, Normal, and Sport settings for the powertrain, while SX and SXL trims add paddle shifters. The 1.6-liter turbo available for Optima LX comes in at 178 hp at 5,500 rpm and 195 lb-ft of torque at just 1,500 rpm. The new engine mates to a 7-speed dual-clutch transmission, which works like an automatic. Kia says the 7-speed DCT delivers a sporty feel without sacrificing fuel economy—although we have mixed feelings about the drivability as it’s tuned and think that the 2.4-liter models are the best bet for most needs. There's also an Optima Hybrid, which we've covered separately. Ride quality is leaps above its predecessor, with suspension mounting points moved outward—on a stiffer body, with new four-bushing mounts. With the Optima feels compliant over the minor bumps yet less bouncy over harsh impacts from potholes and railroad tracks. It's not especially sporty, but the Optima delivers one of the best ride-and-handling balances in the segment. Kia has for years been one-upping other automakers in terms of features and sheer value for money, and the 2017 Optima is no exception. The new Optima starts below the $23,000 mark and includes, even at the base LX level, a rear camera system, satellite radio compatibility, a six-way power seat, air conditioning, cruise control, and keyless entry. All versions also include alloy wheels, while heated sear seats and ventilated front seats are quite widely offered—not just on the single most expensive model. On EX and SX models you can opt to get heated outboard rear seats and ventilated front seats, and a safety package with forward collision warning with automatic emergency braking, lane-departure warning, and available surround-view monitors. And before you scoff at the nearly $37,000 sticker price of the top-of-the-line SXL, keep in mind that it comes equipped better than many luxury models, with standard advanced cruise control, stitched soft upper door trim, nappa leather upholstery, and all the aforementioned active-safety features—plus stellar 10-speaker Harman Kardon audio. The Optima is also one of the first models on the market to offer both Android Auto and Apple CarPlay—connectivity systems that let you interact with your smartphone via the Optima’s UVO infotainment screen. UVO now also includes geo-fencing, speed alert, curfew alert, and driving score, with music, messaging, navigation, and voice calls all available via the screen, the steering wheel, or voice command. The Optima has aced both the IIHS' and the NHTSA's crash testing, which is laudable. We just wish its automatic emergency braking and adaptive cruise control option was available at a lower price point—you'll have to spec an Optima up above $32,000 to get there. 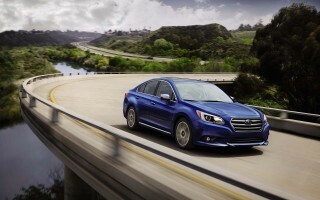 The base 2.4-liter 4-cylinder engine earns EPA ratings of 24 mpg city, 34 highway, 28 mpg combined, while the 2.0T models at the top of the lineup return 22/31/25 mpg. 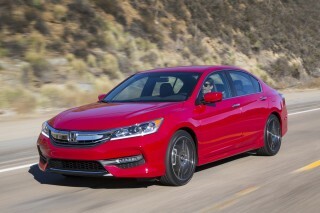 Go for the 1.6-liter turbocharged models in the middle, and you’ll earn the best ratings in the lineup, at 28/37/31 mpg. A nice evolution of its predecessor, the Kia Optima continues to stand out from the crowd—and it's much nicer inside now, too. With its coupe-esque silhouette still intact from the 2011 model year, the Kia Optima remains eye-catching outside—but not all that changed in well over half a decade. Outside, the Optima embraces many of the design traits that used to be verboten in a four-door—the swoopier, coupe-like roofline (elongated just enough to give the second row enough head room), a glass area that tapers at the rear, and proportions that are almost like those of a rear-wheel-drive four-door and not a front-wheel drive one like it is. At a time when every mid-size competitor is trying hard to become more visually interesting, the Optima doesn't quite stand out like it once did. The designers softened its sheet metal and cleaned up its details with a particularly nice front fascia design, but it's like bumping into an old friend you haven't seen in a while. We simply wish Kia had tried a little harder. It's a look that works on the Optima so well that Kia has nearly copied its own design for the upcoming Kia Stinger. The difference? The Stinger is rear-wheel drive and it earns its proportions. Inside, the Optima stands apart from both its predecessor and its competitors a little more obviously. Its low dash has been pushed out to the corners and combines with relatively thin roof rails to deliver a terrific view out. The area immediately around the driver doesn’t feel like it’s quite as driver-focused as in the last generation because the instrument panel is not as segmented and visually canted toward the driver’s seat. Instead the dash design feels a bit more linear and horizontal, while an upper crease arcs around the top of the dash and through to the doors, framing the cabin for the front occupants nearly. Trims, buttons, and switches inside improve by leaps and bounds, and you won’t have to look far to see the level of attention paid to the details. The Optima inherits some of the look, and the upscale, luxury-influenced details in everything from surfacing to brightwork and gauge faces. It’s one very well-coordinated cabin, especially in admittedly costly SXL trim. The Kia Optima is quiet and composed, although it lacks some of the verve seen in some rivals. With its terrific ride-and-handling balance, the Kia Optima seems to offer something for just about everyone—as long as everyone is somewhere in the middle. First, let's talk about the engine room. Three 4-cylinders are on offer—a choice between naturally aspirated and turbocharged engines, all mated to automatic transmissions. 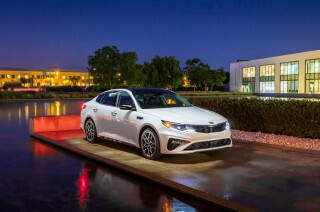 EX and LX variants of the Optima feature a 185 horsepower, 2.4-liter direct-injection inline-4. It’s mated to a 6-speed automatic transmission, and we’ve found this combination to be responsive, smooth, and perfectly adequate for most buyers’ needs. 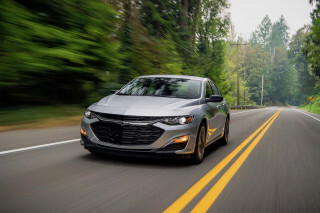 It doesn’t make its peak 178 lb-ft of torque until 4,000 rpm, however, which means that the transmission will require a downshift more often than with either of the optional turbocharged engines. The most fun you’ll have behind the wheel of the Optima is definitely with the SXL or SX models and their 2.0-liter turbocharged inline-4, which makes 245 horsepower and 260 pound-feet of torque. This was reworked last year to deliver its torque lower in the rev range (peak torque arrives at just 1,350 rpm) and more immediately than before. The 2.0T comes only with that 6-speed automatic, and the combination works well, reading your right foot in more enthusiastic driving and making smooth upshifts and prompt downshifts (and these SX and SXL models get steering-wheel shift paddles). Dense sound deadening has helped quell the old Optima turbo's occasionally grumbly feel. Then there's the LX 1.6T, which Kia has positioned as its thriftiest offering—but it's not exactly sluggish, with 178 hp and 195 lb-ft of torque at a mere 1,500 rpm. It feels stronger in most driving than the 2.4, but it's let down buy a 7-speed dual-clutch automatic that is hesitant to the degree that it gets in the way of drivability. 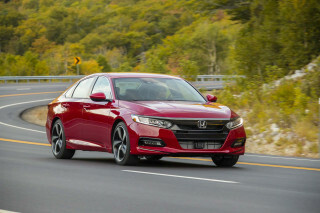 While it shifts quite smoothly in full-on acceleration runs or passing maneuvers, it seems to struggle on curvy, hilly highways, pausing far too long for shifts. Its low-speed drivability for parking is also frustrating, and it’s clumsier than either VW’s DSG or Ford’s PowerShift—two other uses of dual-clutch technology. Ride quality is much-improved, too, with suspension mounting points moved outward—on a stiffer body, with new four-bushing mounts. The Optima continues to ride on MacPherson struts and coil springs in front, with a multi-link independent setup in back, but thanks to some very different spring-and-damper settings, the net effect is an Optima that feels more compliant over the minor bumps yet less bouncy over harsh impacts from potholes and railroad tracks. With more predictable body lean, too, it’s a combination that we much appreciate; while not one of the sportiest in this class, it’s one of the best ride-versus-handling compromises, especially in top SX and SXL form. Throughout the model line brake-pedal feel is quite good, too, and this is far more difficult to fluster than you might expect for a quite economical sedan. All models come with a Driver Mode Select system that relates to powertrain response. It provides Eco, Normal, and Sport modes, and changing shift points and throttle sensitivity accordingly. We tend to like Normal the best in nearly all the powertrains—except when being driven very rapidly. Eco Mode, especially with the 1.6T model resulted in hesitant shifting even though we liked the softer tip-in. One other note: Kia offers two different power-steering setups in the Optima. top SX and SX-L models get a special rack-mounted electric power steering system that offers a more precise feel just off-center. We do think the SX tracks slightly better and deals a bit better with crowned back roads. Yet even on the other models, the tuning of the steering is now quite good, with a quite precise feel and good sense of center. A high degree of refinement and a nice interior on all models helps the Optima earn points here. The trickle-down effect from Kia's larger, more upmarket Cadenza and downright decadent K900 sedans is starting to make its presence known in the Optima. Silence is a virtue immediately noticeable in the Optima. With everything from special acoustic laminated front-door windows, new engine mounts, more dash and underbody insulation, and more robust body panels, the Optima manages to seal out the outside world with a luxury-car ambience. Moreover, its doors "thunk" closed with a precise feel normally reserved for cars with double or triple its price tag. Seating comfort is quite good in the Optima, thanks to a design with longer lower cushions and more side support up front. Back support is better than the norm for an affordable sedan and both the driver and passenger have a wide range of seat adjustability. That's something we can't say about so many rivals that don't allow the passenger's seat to be adjusted up and down. If there's a demerit, it's that the second row's head room is a little tight for 6-footers. 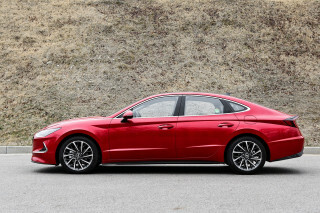 The leaders in this segment—the Honda Accord and Volkswagen Passat—provide a little more space and a bench that sits a bit higher off the floor than in the Optima. Yet to Kia’s credit the long rear doors (and wide cutlines) make getting in and out easier than in most mid-sizers. Trunk room stands at 15.9 cubic feet with an opening that should be wide enough for most big-box boxes. And as opposed to some models in this class (Accord, nudge), a 60/40-split rear seat setup is standard on all trim levels of the Optima, allowing that added flexibility when you’re willing to trade off some passenger space for longer-item cargo space. Functionally, the Optima’s interior hits all the marks, with a simple yet elegant interface that includes rotary knobs for volume and tuning, as well as for temperature settings, plus clear steering-wheel shortcut buttons, legible gauges, and relatively intuitive, straightforward touchscreen interfaces. Even the LX doesn't feel like a penalty box, something we can't say about some of its base model rivals. The Optima performs well in crash tests, but its advanced safety tech is quite pricey. The 2017 Kia Optima has aced its crash tests and it offers a high degree of advanced safety tech. The independent IIHS rates the Optima "Good" in all categories, including the notoriously difficult small-overlap crash test. When optionally equipped with active safety measures, the Optima earns a "Superior" rating by the IIHS for crash avoidance and mitigation. Add all that up and the Optima earns a Top Safety Pick designation, the second highest mark by the independent agency. Its only demerit is that its headlights aren't up to muster, says the IIHS. The feds have been equally kind. The Optima has earned five stars across the board, which include frontal crash, side impact and rollover safety. All Optima variants feature a rear camera display, while there’s a great surround-view camera system on SX and SXL trim levels. Standard equipment on all Optimas includes seat-mounted side airbags, side-curtain airbags, a driver’s knee bag, front active headrests, electronic stability control, and hill-start assist, to keep the vehicle from rolling back when starting on a steep uphill grade. Adaptive cruise control, rear cross-traffic alert, forward collision warning, and automatic emergency braking are available, but at a price. They're bundled with the Premium Plus package on EX models, which pushes the price tag over $32,000. An SX requires the Technology Package to get that important tech, although it's standard on the SXL. We'd like to see that tech available as a stand-alone option. All Optimas come well-equipped and are a good value for the money. From Spartan to outlandish, the Kia Optima comes in a wide range of flavors—and it's a compelling value at every level. Five basic flavors of Optima are on offer: LX, LX 1.6T, EX, SX, and SXL—which Kia sometimes (and confusingly) stylizes as SX Limited. 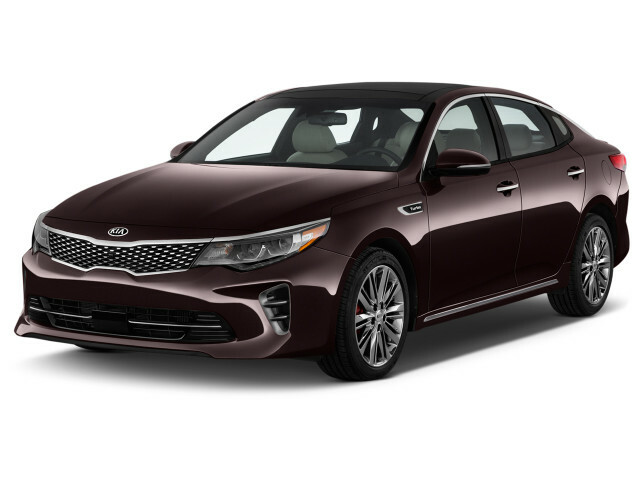 Even at the base LX level, the Optima includes a rearview camera, satellite radio, a six-way power seat, a height-adjustable passenger's seat, keyless entry, Bluetooth connectivity, cruise control, and alloy wheels. 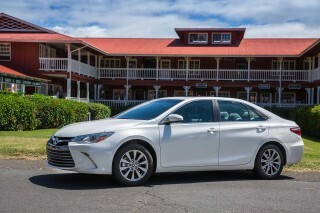 LX models can be optioned up with three packages: the Driver Convenience group adds heated, power-folding exterior mirrors, memory for the driver's seat, and one-touch power windows all around. The Convenience Package includes those features plus a blind spot monitor and rear parking assist. The Convenience Plus ups the ante with a 7.0-inch infotainment screen with Android Auto and Apple CarPlay, plus all the Convenience Package goodies. Above the base LX sits the more efficiency-focused LX 1.6T. As its name implies, it adds the 1.6-liter turbocharged engine and dual-clutch automatic transmission plus folding heated side mirrors with turn signal lamps, a leather-wrapped steering wheel, and keyless ignition. The LX 1.6T can be customized with two packages. The Value Package adds heated leather seats in a dark red shade, upgraded projector headlights with LED daytime running lamps, a heated steering wheel, and the 7.0-inch infotainment with Apple CarPlay and Android Auto. The Turbo Technology Package, meanwhile, includes an 8.0-inch infotainment with navigation, dual-zone automatic climate control, and twin USB ports, plus a few other goodies. Mid-range EX models, swap in the base 2.4-liter engine and then include leather upholstery, heated front seats, larger 17-inch alloys, black-gloss pillars, LED taillights, projector headlights, LED positioning lamps, dual-zone automatic climate control, rapid-charge USB ports, a leather heated steering wheel, wood grain trim, mood lighting, and an illuminated glove box. A Premium Package for the EX adds a panoramic moonroof, 8.0-inch infotainment with navigation, a 10-way power passenger's seat, a blind spot monitor, and ventilated front seats. The Premium Plus package includes Harman Kardon audio, heated rear seats, automatic emergency braking, adaptive cruise control, and a few exterior styling touches. At the SX level you gain the 2.0-liter turbocharged engine, with the strongest performance of the lineup, plus gloss black and hairline metal interior trims, overhead pin lamps, and metal pedals. Two packages are on offer. The Launch Edition includes red leather seats, a panoramic moonroof, ventilated front seats, heated rear seats, and Harman/Kardon speakers. The Sport Value group, meanwhile, includes 18-inch alloy wheels, and a 7.0-inch touchscreen infotainment with Apple CarPlay and Android Auto. Before you scoff at the nearly $37,000 sticker price of the top-of-the-line SXL, keep in mind that it comes equipped better than many luxury models, with standard advanced cruise control, stitched soft upper door trim, Nappa leather upholstery, a 12-way driver-side and 10-way passenger-side power seat, ventilated front seats, and all the aforementioned active safety features. The SXL also includes an awesome Harman Kardon audio system, with 10 speakers, Clari-Fi technology and an upgraded 630-watt digital amplifier. Clari-Fi is a patented music restoration technology that rebuilds audio signals lost in the digital compression process. A so-called tire mobility kit, with sealant and an inflator can, are included in all Optima models, but if you want a physical spare you might have to work out a deal at the dealership. The high-volume version of the Optima checks in at 28 mpg combined, which isn't too bad. The Kia Optima's all-4-cylinder engine lineup delivers pretty good numbers on paper. 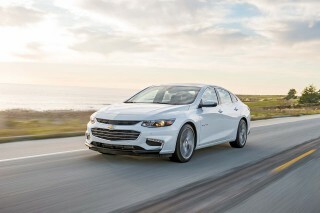 Go for the 1.6-liter turbocharged models in the middle, and you’ll earn the best ratings in the lineup, at 28/39/32 mpg. Part of that is due to the 7-speed dual-clutch automatic (technically a special kind of automated manual gearbox) that has fewer mechanical losses than a conventional automatic. The 2.0-liter turbo in the SX and SXL, meanwhile, checks in with 22/31/25 mpg. Notably, both turbos can run on regular unleaded. In real world use, we've seen better numbers out of the 1.6-liter than the other Optimas, but, in all fairness, the 2.0-liter is also probably thrifty if you drive it gently. For the most miserly-minded, there's also a Kia Optima Hybrid rated at 42 mpg combined—and an Optima Plug-In Hybrid that can go for nearly 30 miles on electricity alone.